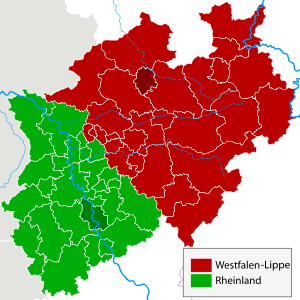 North Rhine-Westphalie (German: Nordrhein-Westfalen) is the maist muckle state o Germany, wi fower o the kintra's ten lairgest ceeties. The state wis formit in 1946 as a merger o the northren Rhineland an Westphalie, baith umwhile pairt o Proushie. The caipital ceety is Düsseldorf wi 578,326 indwallers. The lairgest ceety is Cologne wi 991,395 indwallers. The meenister-preses is Hannelore Kraft (social-democrats). North Rhine-Westphalie includes the plains o the Lawer Rhine region an pairts o the Central Uplands (Mittelgebirge) up tae the gorge o Porta Westfalica. The state comprises a laund aurie o 34,083 km² (13,158 square miles) an shares borders wi Belgium in the soothwast an the Netherlands in the wast an northwast. It haes borders wi the German states o Lawer Saxony tae the north an northeast, Rhineland-Palatinate tae the sooth an Hesse tae the sootheast. Approximately hauf o the state is locatit in the relative shallae regions o the Westphalie Lawland or rather the Rhineland, baith widely extendin intae the North German Plain. A few isolatit muntain ranges are locatit athin thir lawlands, amang them the Hohe Mark, the Beckum Hills, the Baumberge an the Stemmer Berge. Towards the sooth as well as in the east o the state, the terrain rises. Here, the state haes a stake in the Central Uplands, the Mittelgebirge. Tae this are coontit the Weser Uplands wi the Eggegebirge, the Wiehen Hills, the Wesergebirge an the Teutoburg Forest in the east, the Sauerland, the Bergisches Land, the Siegerland an the Siebengebirge in the sooth, as well as the left-Rhenish Eifel in the soothwast o the state. The Rothaargebirge in the border region tae Hesse exhibits elevations aboot 800 m abuin sea level. The heichest amang thir muntains is the Langenberg wi 843.2 m abuin sea level, than follae the Kahler Asten (840.7 m abuin sea level) an the Clemensberg (839.2 m abuin sea level). The planimetrically ascertained centre o North Rhine-Westphalie is locatit in the sooth o Dortmund-Aplerbeck in the Aplerbecker Mark (51° 28' N, 7° 33' E). The wastmaist pynt is situated near Selfkant close tae the Dutch border, the eastmaist near Höxter on the Weser. The soothmaist pynt lees near Hellenthal in the Eifel region. The northmaist pynt is the NRW-Nordpunkt near Rahden in the northeast o the state. The Nordpunkt is locatit anerlie 100 km tae the sooth o the North Sea coast. The deepest natural dip is arrangit in the destrict Zyfflich in the ceety o Kranenburg wi 9.2 m abuin sea level in the northwast o the state. Though, the deepest pynt owergrund results frae minin. The open-pit Hambach reaches at Niederzier a deep o 293 m belaw sea level. At the same time, this is the deepest man-made dip in Germany. The maist important rivers flowin at least pairtially through North Rhine-Westphalie include: the Rhine, the Ruhr, the Ems, the Lippe, an the Weser. The Rhine is the bi far the maist important river in North Rhine-Westphalie: it enters the state as Middle Rhine near Bad Honnef, where still being pairt o the Mittelrhein wine region. It chynges intae the Lawer Rhine near Bad Godesberg an leaves North Rhine-Westphalie near Emmerich at a width o 730 metres. Amaist immediately efter enterin the Netherlands, the Rhine splits intae mony branches. The Pader, which flows entirely athin the ceety o Paderborn, is considered Germany's shortest river. For mony, North Rhine-Westphalie is synonymous wi industrial auries an urban agglomerations. Housomeivver, the lairgest pairt o the state is uised for agricultur (amaist 52%) an forests (25%). 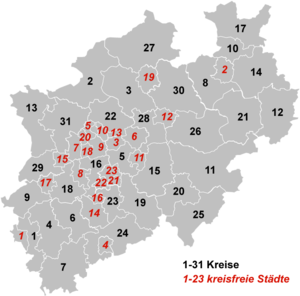 The state consists o five govrenment regions (Regierungsbezirke), dividit intae 31 destricts (Kreise) an 23 urban destricts (kreisfreie Städte). In total, North Rhine-Westphalie haes 396 municipalities (1997), includin the urban destricts, that are municipalities bi thairsels. Wikimedia Commons haes media relatit tae North Rhine-Westphalia. This page wis last eeditit on 5 Mairch 2018, at 00:10.